Taylored Expressions and Fancy Pants Designs! Hello! I don't know about you, but I LOVE Fancy Pants Designs dp, so when the Baker's Dozen was given an opportunity to work with a couple of their lines, I immediately said I was in! For my first card today, I used the Fancy Pants line Be Different. This line is so fun and perfect for boy themed projects-YAY! 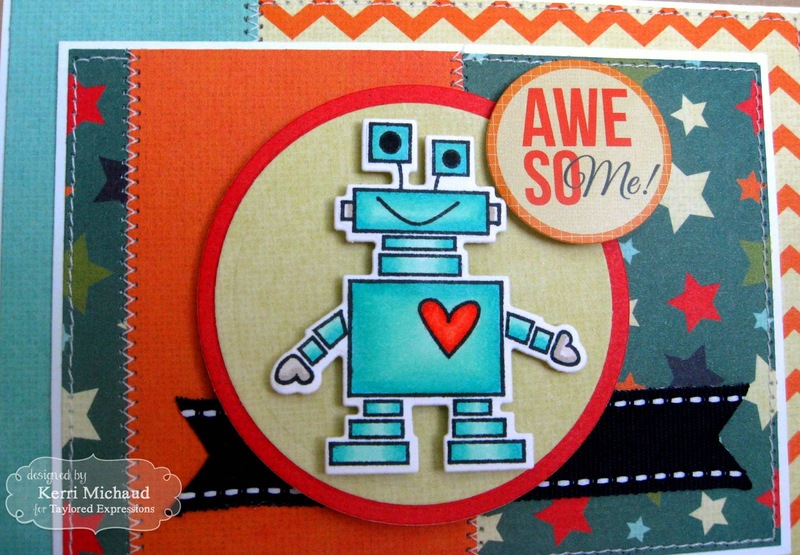 I chose this adorable image from the Taylored Expressions set Far Out and cut it out with a coordinating TE Robots die. I added the sentiment using a Be Different Label Sticker. This time I used the Fancy Pants Designs As You Wish line. 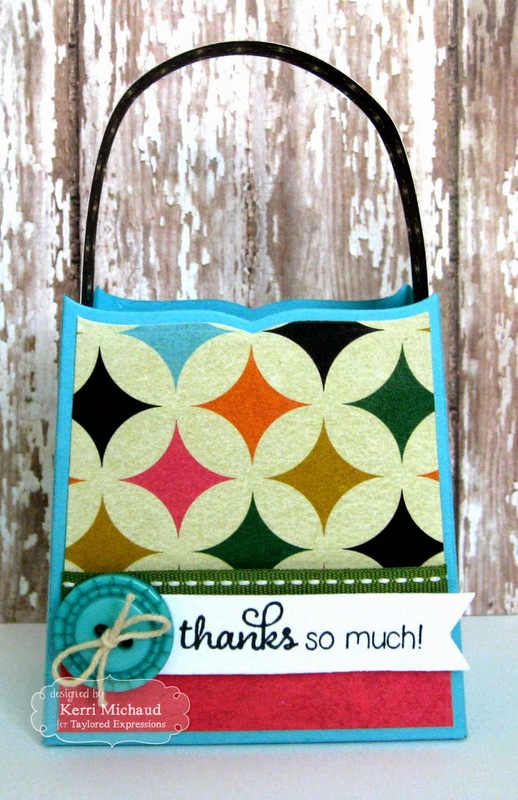 These colors are so fun and I adore this pattern from the Quilt Work sheet of dp found in this line. I first cut the bag out of cardstock, then cut it out of the dp. I trimmed 1/4" off of the edges of the dp to create my top layer. I added the sentiment from the TE set Sunshiny Day onto a Banner Stacklets 1 Die and the fabulous button comes from the As You Wish Button Set! Taylored Expressions and Fancy Pants Designs both have prize packs that you can win! Just head over to the TE Blog and leave a comment, then head over to the Fancy Pants Designs Blog and leave another comment! that is so cute!!! love that little robot!! great colors. There is so much detail in both projects. The little robot is darling. Love the "purse". Love your cute robot card but that "sack it to you" gift bag is such a cutie as well! I really want that die, too! Your card is adorable and the gift bag is wonderful. I don't know where to buy or order Fancy Pants, can you let me know? These are both super adorable projects!!! Love! Cute card and gift bag - love the little bot. 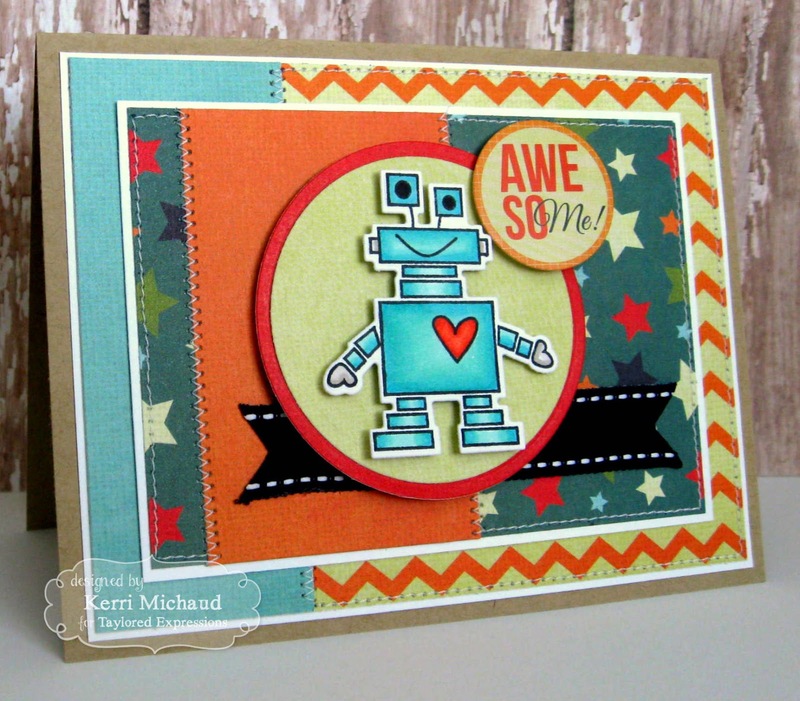 What a cute robot card! I love the variety of patterns and stitching.